Are you looking for vintage entertainment for a special occasion or wartime themed event; do you want a good old fashioned sing-a-long and knees up? Sisters in Song evoke the nostalgia of the war years through song! Songs from WW1 & 2 are timeless classics that everyone can hum along to; they recreate the atmosphere of the war years when life was tough but Britain's spirit was tougher! 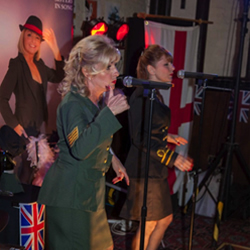 Sisters in Song, the 'Forces Sweethearts', will transport you back to the war years with all the hits of the era including 'I'll be seeing you', 'Bye, bye, Blackbird', 'Bless 'em all', 'Every time we say goodbye', 'Hang out your washing on the Ziegfreid line' and many, many more. If you're after close part harmonies then look no further as SiS can deliver consummate renditions of The Andrew Sisters' 'Boogie Woogie Bugle Boy', Glen Miller's 'In the Mood', Carmen Miranda's 'Tico, tico' and many more!